YOU ARE MY BELOVED SON, IN YOU I AM WELL PLEASED - This Sunday, we celebrate the Baptism of the Lord. Like last Sunday's Epiphany, where the divinity of Jesus the King was made manifest to the Magi from the east, today, Jesus is made made manifest as the Son of God, in the presence of the Trinity. And yet, both events are wrapped in the humility of Jesus' humanity. Jesus had no need to submit to baptism, as he did not know sin, yet he submitted in solidarity with us in order to show us the way to salvation. 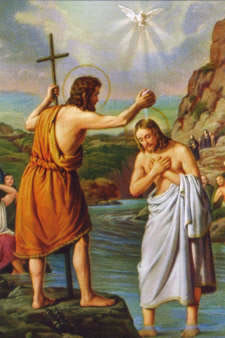 In our Gospel reading (Luke 3:15-16, 21-22), we hear of the miraculous occasion of Jesus' baptism. "The people were filled with expectation, and all were asking in their hearts whether John might be the Christ. John answered them all, saying, 'I am baptizing you with water, but one mightier than I is coming. I am not worthy to loosen the thongs of his sandals. He will baptize you with the Holy Spirit and fire.' After all the people had been baptized and Jesus also had been baptized and was praying, heaven was opened and the Holy Spirit descended upon him in bodily form like a dove. And a voice came from heaven, 'You are my beloved Son; with you I am well pleased.'" In our first reading (Isaiah 42:1-4, 6-7), Isaiah's prophesy prefigures the scene of Jesus' baptism in which the Lord announces and anoints his servant with whom he is well pleased. "Thus says the LORD: Here is my servant whom I uphold, my chosen one with whom I am pleased, upon whom I have put my spirit; he shall bring forth justice to the nations, not crying out, not shouting, not making his voice heard in the street. a bruised reed he shall not break, and a smoldering wick he shall not quench, until he establishes justice on the earth; the coastlands will wait for his teaching. "I, the LORD, have called you for the victory of justice, I have grasped you by the hand; I formed you, and set you as a covenant of the people, a light for the nations, to open the eyes of the blind, to bring out prisoners from confinement, and from the dungeon, those who live in darkness." "Peter proceeded to speak to those gathered in the house of Cornelius, saying: 'In truth, I see that God shows no partiality. Rather, in every nation whoever fears him and acts uprightly is acceptable to him. You know the word that he sent to the Israelites as he proclaimed peace through Jesus Christ, who is Lord of all, what has happened all over Judea, beginning in Galilee after the baptism that John preached, how God anointed Jesus of Nazareth with the Holy Spirit and power. He went about doing good and healing all those oppressed by the devil, for God was with him.'" Even though most of us were baptized as infants, it is good now and then to reflect on our baptism and its effect on us. Essentially, this is the same baptism experienced by Jesus, with the same anointing by God as Priest, Prophet and King. Truly, we are called to be.